Pashmina scarf with silver fox fur trim (SOLD). See more photos of these scarves modelled by Alexandra and Karen by clicking on the photos above. Please note that this current website does not have a shopping cart. 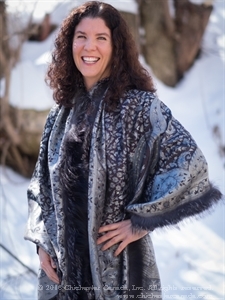 To buy our Scarves online, please go to our e-commerce website at NaturalExotics.ca. We have beautiful scarves made of different materials, such as pashmina, silk, silk with cocoons, and cotton. They come in an assortment of colors and designs. We sell the scarves by themselves and also trimmed with fur (e.g. silver fox, rabbit). 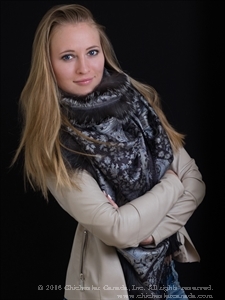 The scarf shown in the pictures above is a pashmina scarf trimmed with luxurious silver fox fur. See the gallery below for individual scarves that are available for sale. The scarves shown in the gallery are for retail only. For wholesale customers, if you are interested in purchasing scarves with fur trim or just the scarves by themselves, please call us for prices and availability. We can make the fur-trimmed scarves to your specifications. Genus and species of silver fox: Vulpes vulpes. Wild.